Dr. Goldfaden's fast absorbing, ultra-light oil-free, PABA-free and fragrance-free SPF 30 sunscreen protects your skin from harmful UVA/UVB rays. This unique sun protection product provides an ultra-fine mist that can be applied directly to your skin and even over your makeup. Nano technology makes this formula widely sought-after due to the strong protecting shield that it offers in a sheer, non-white or filmy texture. Provides both physical and chemical sunscreen coverage. Red Tea Extract provides antioxidant protection. 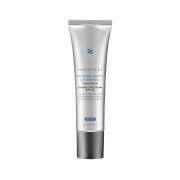 Protects skin against pre-mature aging. Apply 1-2 sprays on the face and neck after moisturizing to protect against UVA/UVB rays. In direct sun, apply frequently for optimal sun protection. Titanium Dioxide Micronized, Octinoxate, Benzopheone, Purified Water, Polydimethylsiloxane, Dimethylsiloxane, Phenoxyethanol, Ethylhexylglycerin. I have very sensitive skin and everything clogs my pores. I was amazed when I tried this and it didn't irritate my rosacea. And it worked well too. Fabulous! Have already picked up two more for our spring break vacation. .
Sunscreen is so important and so hard to find for oily skin. This is excellent, it goes on matte, plays well with makeup, no white cast, absorbs quickly, doesn't create an oil slick in an hour.A makeup artist in a department store recommended it and I checked to see if Skinstore had it bc of the value available here. The easiest way to apply is to spray into your hand and pat on. Spraying is a bit tricky.If you have searched high and low for a good sunscreen this is worth a try! Hopefully they will make higher SPF versions for extended time in the sun. Love this!! Love this sunscreen; it can go over any cream or makeup; it is light and absorbs very quickly; not thick or oily. No trace.